It's been over a year since we've seen a true flagship Android device from Sony, with the Xperia S headlining a range of "NXT" devices for the 2012 year. Now we're in 2013 and the smartphone landscape is looking very different: phones are getting slimmer, displays are getting larger, chipsets are getting faster and software is more important than ever. And to kick off the smartphone release period of 2013, Sony has brought their best effort yet. The Xperia Z represents a refined Sony, one that has looked closely at the market to bring a device that - hopefully - consumers will want. The flagship is slimmer (7.9mm) and tougher (waterproof) than anything Sony has released before; it combines a large, high resolution display (5.0" 1080p) with a better camera (13 MP) and more powerful processor (1.5 GHz quad-core); and the software has received a modern-day polish. However in 2013 the competition is stronger than ever. We've got the HTC One on the one hand, packing one of the sleekest aluminium bodies going around, and on the other we've got the Samsung Galaxy S IV, which puts tons of features behind a huge marketing budget. And let's not forget the efforts of Nokia with their Lumia line and the ever-faithful iPhone, both of which should see a refresh later this year. 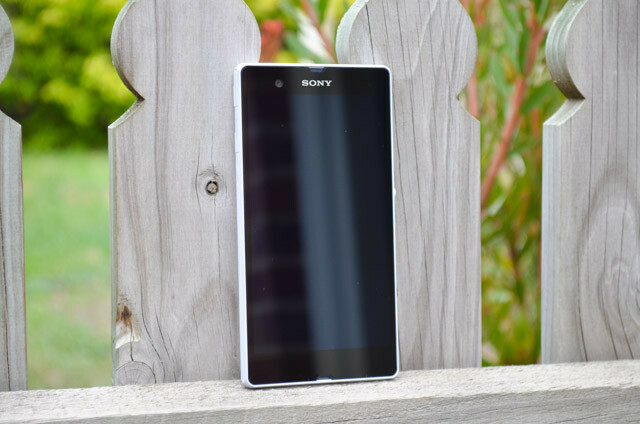 The Xperia Z must stand out if it's going to appeal to the masses. As always, a big thanks goes out to MobiCity who provided me with the Sony Xperia Z for this review. Check them out if you're in the market for a new, unlocked smartphone in either Australia or Europe/UK, because they usually get all the best stuff very quickly. It's a high-end phone that comes with some high-end specifications. Check out the full list of what the Xperia Z comes with below. Often I'll bury my final thoughts on the design of a phone much deeper into the review, but not this time; this time I need to make it painfully clear: the Xperia Z is by far Sony's best smartphone design to date. It blows everything the company has done previously right out of the water, as the refinement and sleekness of this design is clear from the moment you get it into your hands. 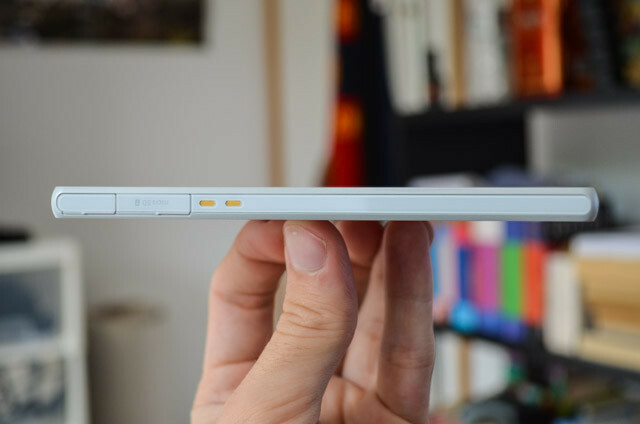 It may not be the absolute best design going around (the HTC One may take that crown), but the Xperia Z does a number of things right, the first of which is the thickness. Sony has done no fancy curving to hide the actual size of the phone, instead using a uniform thickness of 7.9mm (8.15mm with a slight ridge around the display) from head to toe, with the resultant design looking remarkably slender. The uniform thickness fits well with the design code Sony has deployed for the Xperia Z; a code that envisions a phone as a rectangular slab of technology, and a code that I think looks great, especially when accompanied by minimalist cues and the latest Android software. Yes, the slab is quite large to accommodate the spacious 5-inch display, but it's only marginally taller than many other devices on the market with smaller displays, so it doesn't feel as foreign as, say, the Galaxy Note II in your hands. 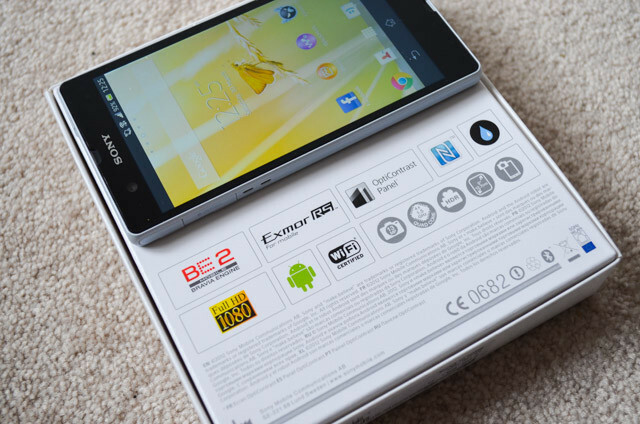 Both the front and back of the Z are relatively clean when it comes to design elements: the front has the display, front camera, speaker/microphone cutouts and some simple Sony branding; meanwhile the back features the slightly-offset 13-megapixel camera and flash, a microphone, centered Xperia branding, plus some regulatory marks along the bottom. The notification light that occupies a spot on the top right of the front face shouldn't be ignored, as it's an incredibly handy feature for easily knowing whether you have unread messages. A simple glance at the phone on a desk will tell you if you need to pick it up and turn it on, a feature I missed when I was using Windows Phone for the past few months. Around the edges of the phone the design ethic isn't so clean, partially due to the efforts required to waterproof the phone. 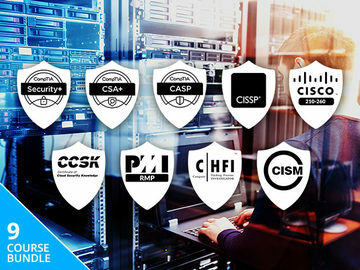 Every port is covered by a flappy bit of plastic, which can be a little bit annoying but it's a necessary tradeoff for IP57 certification. 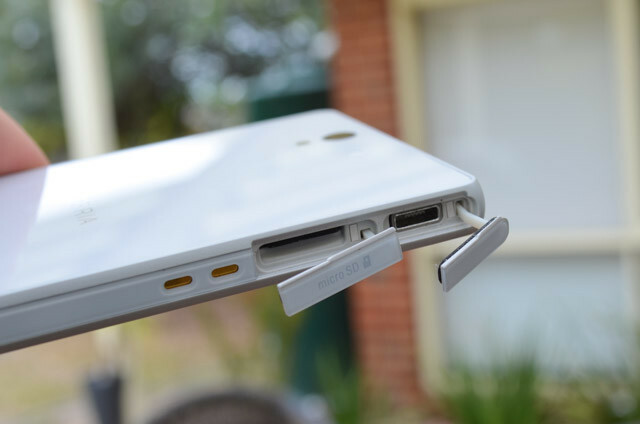 There are four flaps in total: one on the top for the 3.5mm audio jack, two on the left for the microUSB port and microSD slot and one on the right for the micro SIM. 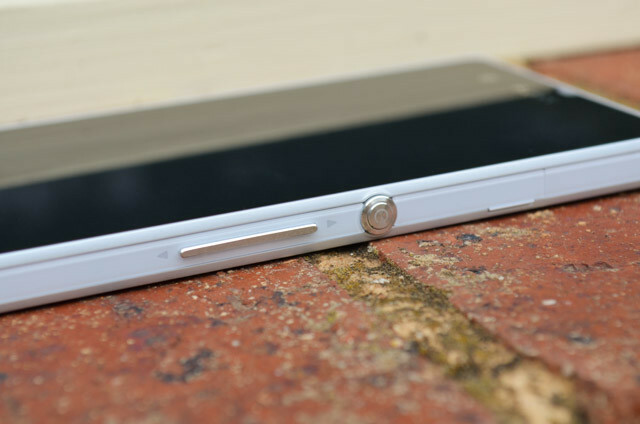 One of the stranger design elements of the Xperia Z, almost providing visual discord on the right hand side, is the round power button that sits above a slim volume rocker. It's functionally in the perfect spot - just over half way up the side - and its shape allows for easy use, but it looks somewhat out of place. Had I been designing the phone I would have chosen to use a slimmer button similar to the volume rocker, but it's thankfully only a minor detail. Materials-wise the Xperia Z is essentially two large slabs of glass joined by a "glass fibre polyamide" frame, the latter of which for all intents and purposes feels like a strong plastic. The use of glass on both faces definitely gives the Z a premium feel: not quite to the extent of the aluminium-bodied HTC One, but above the cheap-plastic Samsung Galaxy range, which is definitely a good thing. Sony claims that the tempered rear glass is durable and "anything but fragile", but I always get a little nervous when a company uses more glass than might be necessary, mostly because we've all seen our fair share of cracked iPhone 4/4S backs. There's also the issue that the glass rear accumulates a lot of fingerprints, requiring you to clean both the front and back to have a pristine smartphone, but at least it feels quite nice in your hands. 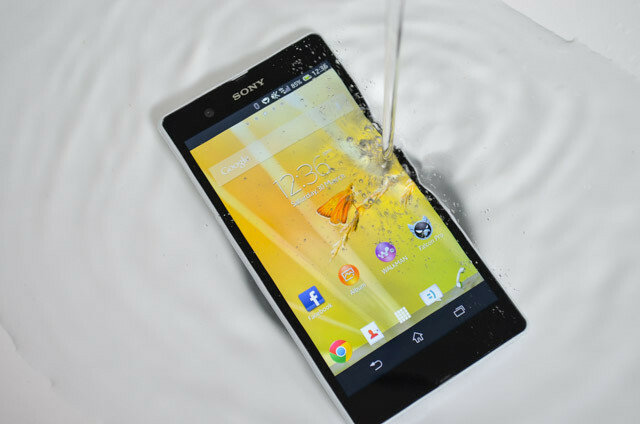 Finally, I can't write up an Xperia Z review without making good mention of the IP55 and IP57 waterproofing protection that this phone carries. 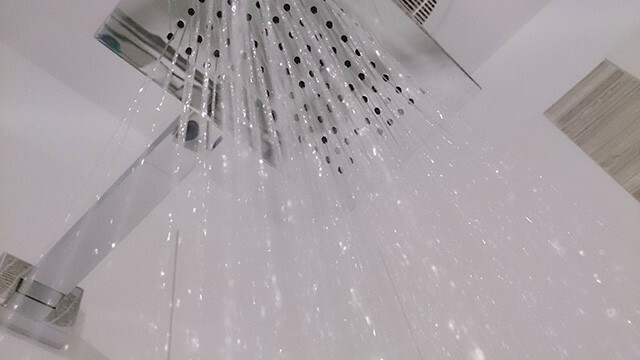 To start with, the two codes signify the device is dust protected, protected against medium-strength water jets and can survive a submersion in water up to 1m for 30 minutes. Obviously it's quite cool being able to drop your phone in a tank of water and not worry as it sinks to the bottom, but it's important to realize that the touchscreen does not respond to touches while fully submerged. This makes it disappointingly impossible to take underwater photos, and limits the overall usefulness of the protective features. Regardless of the fact the touchscreen doesn't work while submerged, there are some handy reasons to have a waterproof phone. For one, spilling liquids on it is no big deal at all, and secondly you can take the phone swimming if you really want to (note: immersion in saltwater is not advised and can ruin the device). 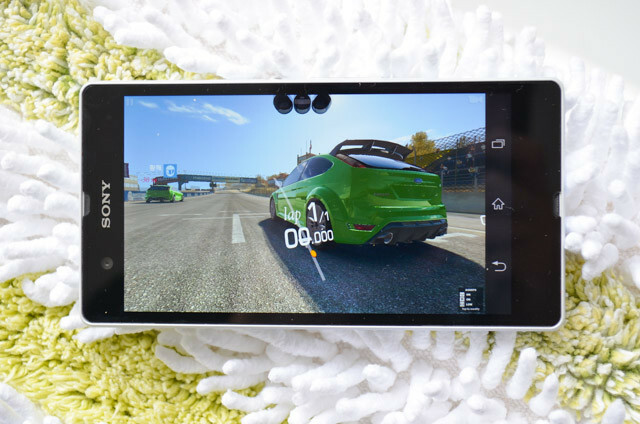 Also, you can finally be productive in the shower or bath, as the device is still usable to an extent with some water droplets on the display; I for one enjoyed having a quick race in Real Racing 3 when I was in the shower. At the end of the day though, it's simply an advantage having the protection as you don't have to worry as much around liquids or pools. You'll probably get sick of browsing Twitter while showering, or dropping your phone in water just to confirm it's still waterproof, so when it comes down to it, it's the extra protection that becomes the bonus. Look at all those pixels! Perhaps the first thing you'll notice when using the Xperia Z's 5-inch, 1920 x 1080 panel is that it hits well above the golden 300 ppi density for crispness at 441 ppi, bringing extreme clarity in all situations. Just like with a 720p display you won't be able to distinguish individual pixels on the Z's screen, but packing in 2 million pixels in such a small space takes sharpness above and beyond what you may have seen before. Quite frankly the sharpness of text and the crispness of photos is a wonder to behold on a 1080p display such as this, and from the moment your eyes start staring at the screen you'll never want to use anything less. Reading web pages has never been more inviting than on a display such as this, because the text looks even better than it does on a majority of printed material. And looking at those photos you've just taken? Well the detail is incredible. Of course a major question that I'm sure a number of people will have is: "what is the advantage of a 1080p display when a 720p equivalent would already be over that magical pixel density limit, at a lesser cost to battery and performance?" Those last two aspects I'll be covering in more detail in their respective sections, but one of the advantages to pushing the pixel density boundaries is you end up with better natural anti-aliasing. 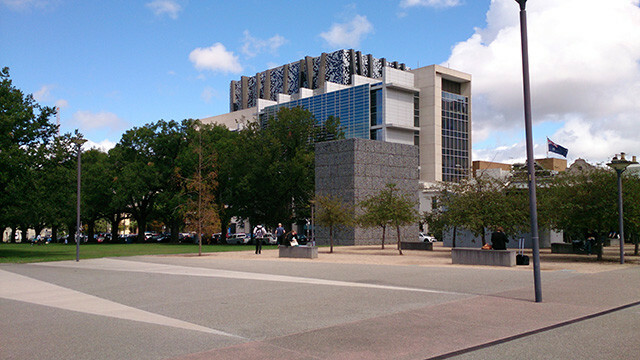 On lower-density panels when rendering curves and diagonal lines, software must compensate to a greater extent to prevent horrible jagged lines, and it does so using a technique called anti-aliasing. However, when you've got a panel that's denser, relying on software is less important as it can simply map the curves and diagonal lines to more physical points, creating a more natural look. Even above a density level that makes pixels invisible, you'll still notice the effects of having graphics mapped to more physical points. Think of the difference between a 720p panel and a 1080p panel as going from 2xFSAA to 4xFSAA in a PC video game: the difference is small, but it does improve the visuals to an extent. Plus, anything to improve the sharpness of a mobile display should not be overlooked. Now on to other aspects of the Sony Xperia Z's display, and perhaps what is one of the bigger downsides to the phone. 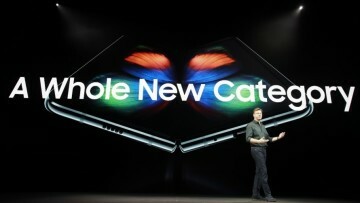 For some reason Sony has opted to use a e-IPS TFT LCD technology for the Z's display panel (Sony does call it a "Reality Display", but this is nothing more than marketing rubbish), despite the fact that most other flagship smartphones on the market incorporate higher-quality IPS panels. The difference between Sony's e-IPS panel and a standard IPS panel is definitely noticeable through a number of aspects, the most prevalent of which is the viewing angles. It's been quite some time since I've used a phone with a usable screen range as narrow as the Xperia Z's; that is to say, the viewing angles are shocking. Any deviation off-center causes considerable washing out of colors, and all color quality is immediately lost - basically you don't want to use this phone on an angle. Standard color quality is also not as vibrant or immediately popping out as I've experienced with rival flagships, especially those that incorporate Super LCD technology. Now I'm not saying that color reproduction is poor, but it's maybe not as good as what you'd expect for the price you're paying for the phone, and other, better (in this area) displays are definitely available on the market. Now you'll notice I did mention "standard" color quality, as there's some decent software at work in some situations that Sony likes to call the "Mobile Bravia Engine 2". 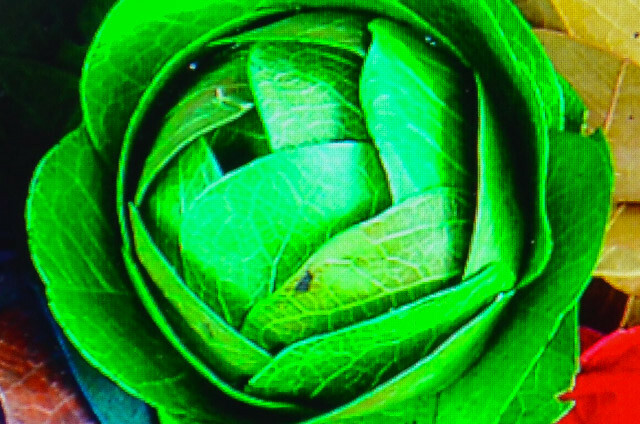 Basically when you have this option enabled (which it is by default), when you look at photos or watch videos in the provided software, the quality is greatly enhanced through increased vibrancy, better contrast and grain reduction. 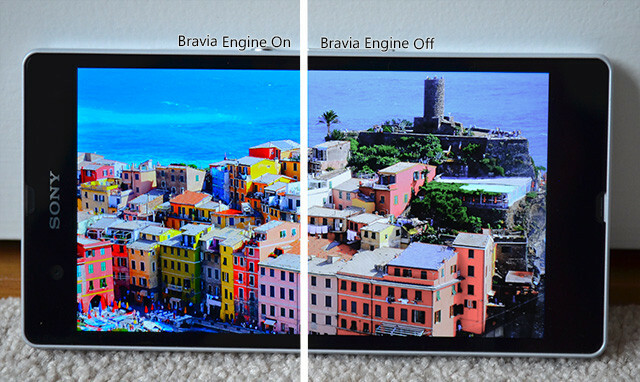 The Mobile Bravia Engine 2 actually works really well, as photos and videos look absolutely gorgeous on the 5-inch display: colors pop out at levels you simply don't get elsewhere in the operating system, while the contrast and clarity are breath-taking. It doesn't always enhance the quality of photos you've taken using the rear camera - it can oversaturate in some situations - but it mostly works wonders to display vibrant imagery. It's just a shame you don't get this sort of quality in all circumstances. In some aspects the Xperia Z really impresses with the display, such as the massive amount of real-estate, the incredible pixel density and the Mobile Bravia Engine 2; but in other areas it's let down by e-IPS technology, like poor viewing angles and average color reproduction. I feel blown away and let down at the same time - a strange mix of feelings that I perhaps shouldn't be experiencing with a high-end phone. Like seemingly every Android smartphone released on the market, the Xperia Z is not pre-loaded with the most recent version of Android, instead relying on the one-version-old Android 4.1 until it gets updated to the most recent flavor (4.2). Sony has also opted once again for a custom skin placed atop the standard Android user interface, but luckily it's not particularly intrusive as far as OEM skins go. 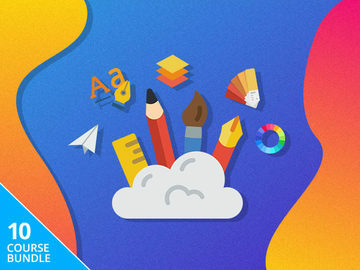 The overall design switches - for the most part - dark color schemes for lighter ones, occasionally introducing gradients but often sticking to the flat, blocky design that accompanies stock Android. Many apps have had elements shifted and adjusted to fit with the Sony app, although often these cosmetic changes do not bring any new features, meaning that once again we have skinning for the sake of skinning, which I'm never a fan of. That said, the changes seem to blend in well with the Android design guidelines, so switching to a purely Google app like Gmail never feels like you're making a huge ecosystem leap. Sony's own set of widgets, often which are just skinned versions of the stock Android ones, look surprisingly good when combined with the visual changes they have made (something I can't say for every Android phone), so there's less need for third-party alternatives. 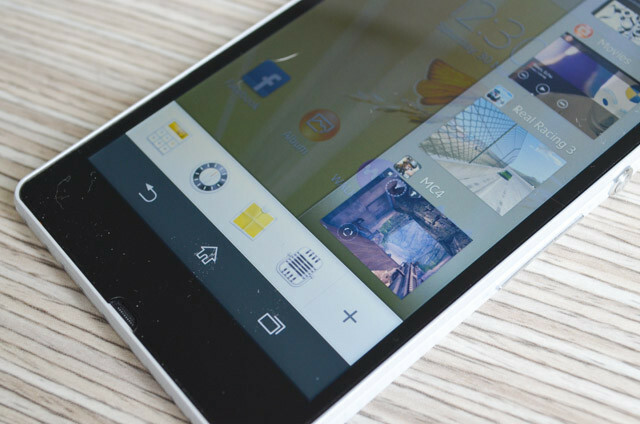 Much like the design of the phone itself, the Xperia Z's lockscreen is beautifully minimalist while including quick shortcuts that easily take you to your music and the camera. The notification pane is also minimalist, but it does manage to include the standard array of quick shortcuts for easy management of your device, plus you do get the expanded notifications that were introduced in Android 4.1 "Jelly Bean". 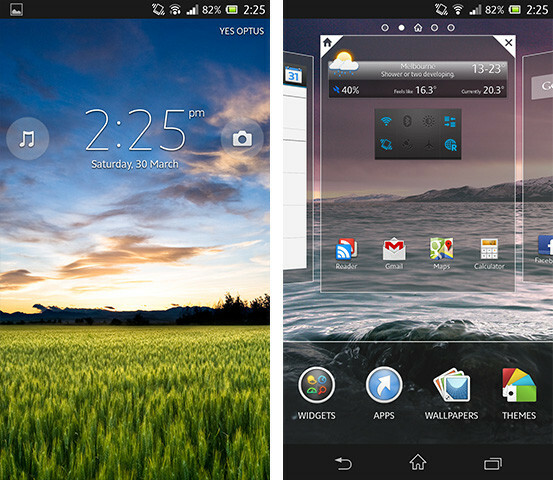 The home screen layout is quite easy to manage thanks to the customized Sony launcher, allowing for adding new widgets, changing wallpapers, adding new screens, resizing existing widgets and altering the overall theme with just a few presses. I also found the skinned application manager/multitasking pane to be incredibly useful, as alongside showing you your most recently used apps, there's also a range of "small apps" - such as a timer, calculator and notes - that you can launch and have float on the top of your existing application, which gives you quick access to some important tools. Most of the other custom features, that make up the operating system, center around wirelessly playing content on other devices in your home, specifically other Sony devices such as TVs. Many apps feature the ability to "throw" content to other in-home devices for easy viewing, although my home theater setup is such that I couldn't test these features out properly; I'll just assume they work best if you have Bravia hardware in your living room. As for the apps Sony has included on the Xperia Z, a number of them I would consider spam, pointless or an attempt to bring other Sony services to the phone. 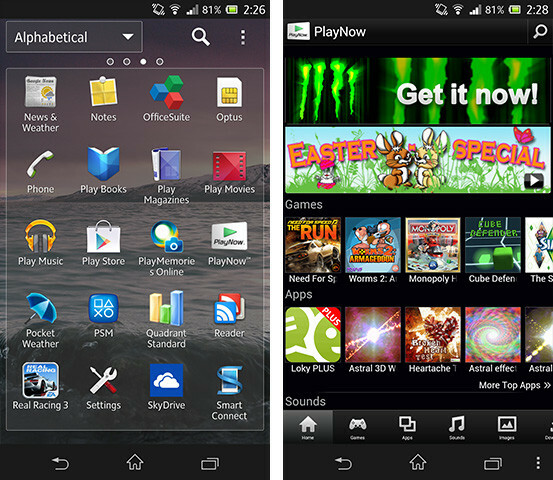 PlayNow is a rubbish and extremely slow app discovery tool; Socialife displays many social streams in the one app, however using individual apps is often easier; Sony Selects is another app discovery tool; Media Remote is literally a link to a Play Store app (why not just pre-load it? ); Xperia Link is a tool for tethering, despite the phone already including separate (and functional) settings for that; and File Commander is a pretty spammy file manager. 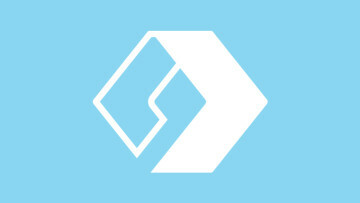 A number of the other apps might be considered useful to some people, such as the Backup & Restore app, the Diagnostics tool (although it isn't an app for end-users), NeoReader for scanning barcodes, TrackID for music identification, Wisepilot for navigation (although Google Maps is quite goo already) and OfficeSuite for viewing documents. 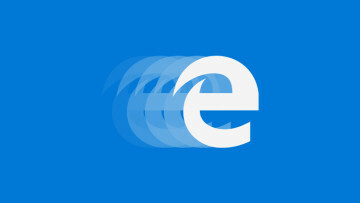 Sony has forgone a custom skinned browser and instead bundled Chrome, which is a good choice considering skinned browsers can often be a hassle to use. Naturally Sony has also bundled their Music Unlimited and Video Unlimited services through apps of their own, which provide alternate channels to getting videos and music outside the Play Store; the apps aren't the best, but at least they're functional. Of course there's also the PlayStation Mobile app that you can install on the Xperia Z, although unfortunately the ecosystem is woefully lacking at the moment despite Sony's gargantuan presence in the gaming space. 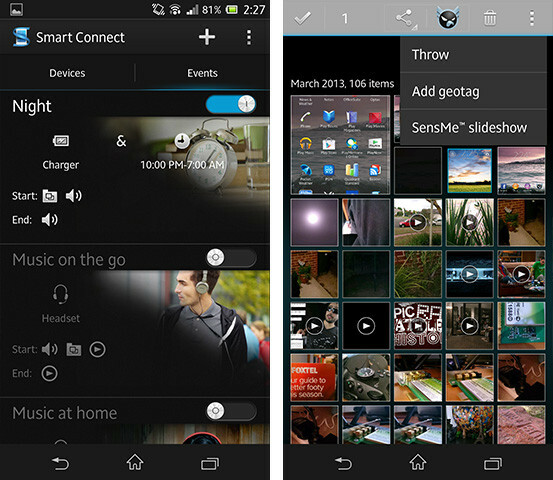 Two apps that I do want to highlight, though, are the Walkman music player app, and Smart Connect. I'll start with Smart Connect because it's made my life a lot easier, in a way that reminds me of the Smart Actions app you'll find on Motorola phones. Basically in Smart Connect you can set certain actions occur when parameters are met, such as you might turn your phone to silent when you plug your phone in for charging, or start automatically playing music when you plug headphones in. The app allows for a lot of flexibility in managing your phone automatically, and it really can take care of some basic, every day processes if you set up the app to work in your favor. It's not particularly well advertised on the Xperia Z, so if you do end up purchasing this device I would highly recommend looking at what Smart Connect can do. I like the Walkman music player app because it's both visually appealing and also easy to use: there's no fuss and no mess associated with the app, you simply head to the Playing tab to see what you're currently playing, or head to My Music to select tracks. Sony pulls a variety of data from Gracenote about the tracks you have on your phone, so you can easily find extra data about artists and albums, as well as sort tracks by moods in the SenseMe section. Plus Sony has been kind to audiophiles with the Walkman app by including a range of great settings, which I explore in more detail in the media section below. And in case you don't want to use Sony's custom app, Google Play Music is also bundled if you prefer a more stock experience. 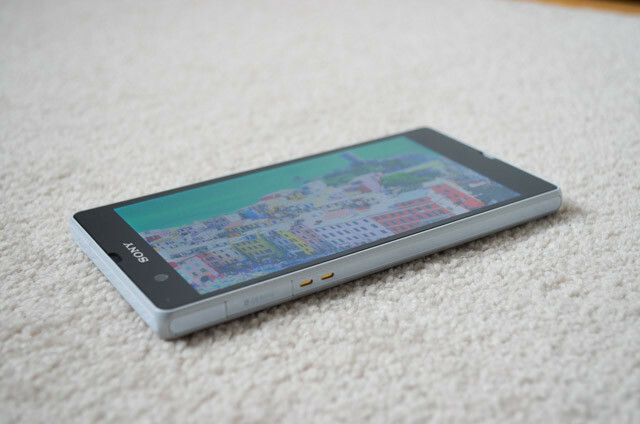 Are there any cool standout features that make the software of the Xperia Z anything outside the ordinary? Not really. But will you be disappointed by Sony's decision to include a custom skin atop Android 4.1? Probably not, and in some ways that's just as important. This isn't the first time we've seen a device with a Qualcomm Snapdragon S4 Pro chipset inside, as previous devices including the Google Nexus 4, LG Optimus G and HTC Droid DNA all utilized the high-end chip. It's also not the highest-end chip you can get at the moment, as shortly after the Xperia Z was announced, Qualcomm came out with the Snapdragon 600 and 800 chips that take performance to the next level. So while you're not getting the most up-to-date internals in the Sony Xperia Z, it still packs enough punch to be mighty fast. The APQ8064 chipset packs a 1.5 GHz quad-core Krait CPU alongside an Adreno 320 GPU, and that's accompanied on the motherboard by 2 GB of RAM and 16 GB of internal storage. 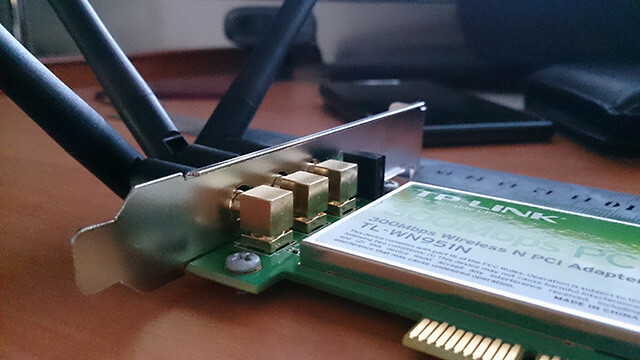 The chipset also packs Wi-Fi 802.11a/b/g/n on both the 2.4 GHz and 5 GHz bands, and Bluetooth 4.0. The setup of the APQ8064 dictates that several other wireless components must be included on a separate chip, so Sony has chucked in Qualcomm's MDM9215M to provide Cat. 3 LTE (up to 100 Mbps downlink) and DC-HSPA+, plus A-GPS, GLONASS and USB connectivity. 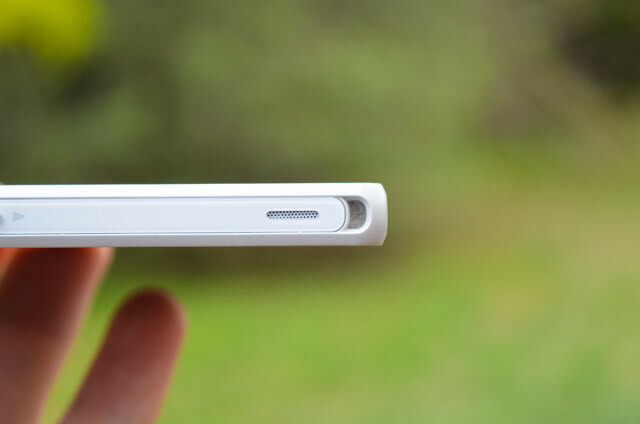 A further chip inside the Xperia Z facilitates NFC, which can be found around one third of the way down the back of the device. In general usage, the Snapdragon S4 Pro makes short work of everyday tasks, opening apps without pause and switching with all the ease you would expect from a mobile quad-core processor. Operating system transitions and animations were easily rendered at 60 frames per second, so you never feel like there's some sort of system bottleneck or system lag - exactly what you expect from a flagship smartphone. As I mentioned in the software section, Sony has bundled Chrome as the default and only browser on the device, which isn't exactly the pinnacle of phone browser performance, but it seems to work decently on the Xperia Z. I don't believe all four cores are utilized when Chrome is being used, so you can experience some re-rendering slowness when zooming or panning graphic-heavy webpages, but overall the browsing experience was acceptable. Compared to the Nexus 4, which also uses the Snapdragon S4 Pro chip, the Xperia Z has more than twice as many pixels in its display to render to, as the display jumps from 1280 x 720 to 1920 x 1080. You'll be glad to know this doesn't make a huge difference across the operating system aside from the phone using slightly more resources, but in gaming matters are a little different. 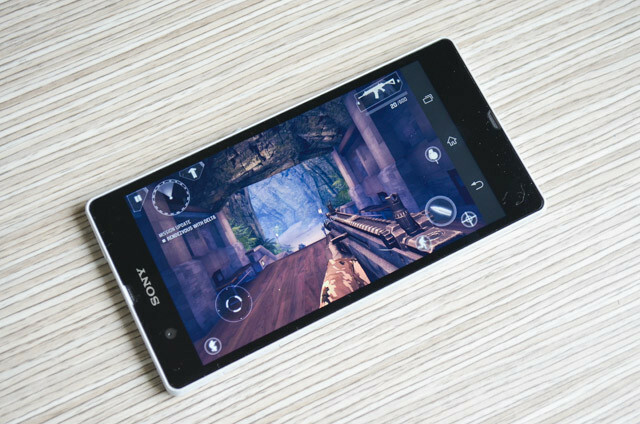 Your standard Angry Birds and Temple Run have no issues on the Xperia Z's 1080p display, and the majority of "last-gen" (so-to-speak) 3D games also perform superbly, including titles such as Shadowgun and Asphalt 6: Adrenaline. However some of the absolute latest games that I tried - Modern Combat 4 and Real Racing 3 - plus the always-intense Grand Theft Auto III fared a little differently. In these three games the performance was generally okay, however occasionally I noticed some slowdowns that took the game to around 15-20 FPS, which isn't too great when you're in the middle of some intense combat. Real Racing 3 experienced the most slowdowns out of the three, and I would almost certainly say that this is due to the phone having to render the game at a full 1080p, which takes its toll on the Adreno 320. It also caused the phone to emit a lot of heat - I recorded 47°C (116°F) from the spot just below the camera on the back of the device while gaming. I do have to say, however, that the natural antli-aliasing of the 1080p display while gaming makes everything look superb; in fact I've never seen a mobile game look so great as when I was playing Real Racing 3: the quality was simply outstanding. As always I have some synthetic benchmarks to show how the device performs in comparison to other phones on the market. 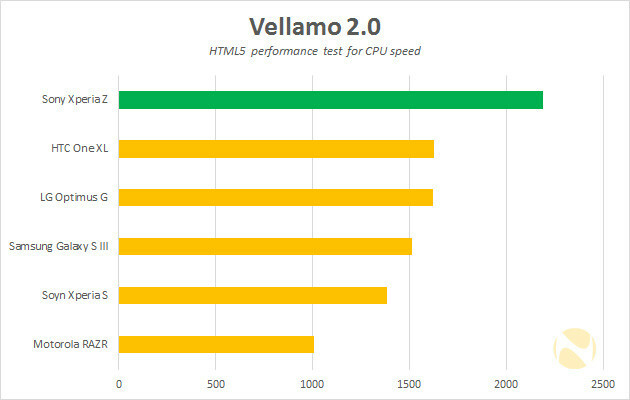 Futuremark Peacekeeper is an in-browser benchmark to test web and CPU performance, Vellamo is an app from Qualcomm designed to test a number of CPU, GPU and memory features, and finally GLBenchmark is a standard (and fairly intense) GPU benchmark. 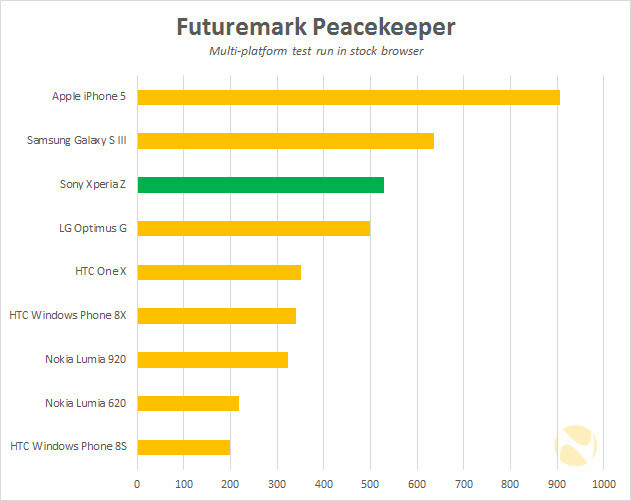 Peacekeeper is a benchmark that varies drastically depending on the level of browser optimization, as you can see the Galaxy S III comes in at 20% faster than the Xperia Z despite having relatively similar on-paper hardware (1.4 GHz Cortex-A9 quad-core vs. 1.5 GHz Krait quad-core). 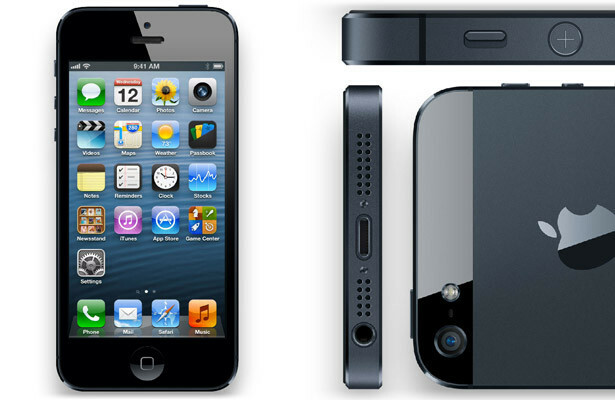 Nothing we've tested here at Neowin has managed to beat the iPhone 5 in this benchmark as of yet. 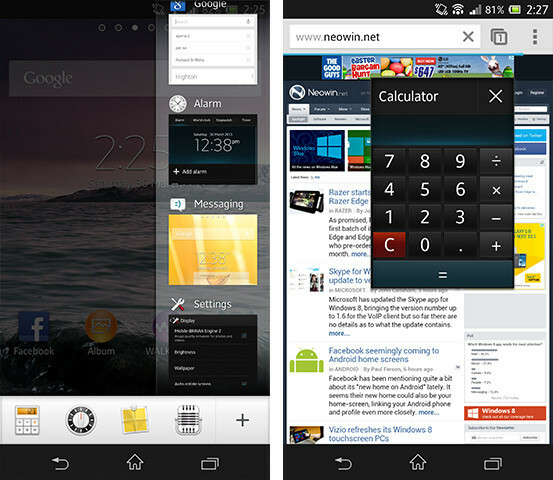 The Xperia Z blitzes Vellamo 2.0 to be the top device, thanks in-part to speed improvements contained in Android 4.1. The Z produced a result that was 35% faster than the LG Optimus G with an identical chipset, which indicates that there's an external optimization factor at play here, again most likely from Android 4.1, which was not running on the Optimus G when we recorded our benchmark result. 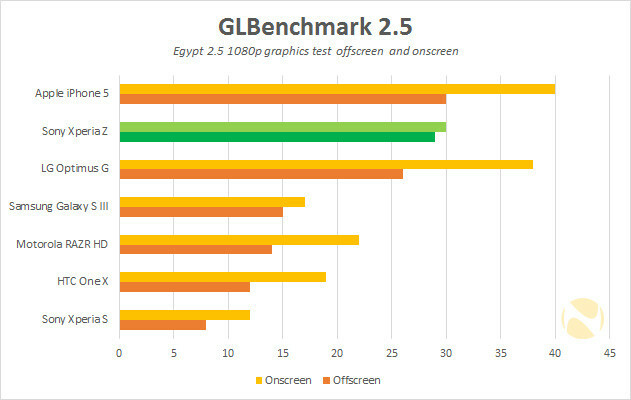 In GLBenchmark it's not surprising to see the Xperia Z record similar results for the off-screen and onscreen tests, as both are run at 1080p due to the resolution of the device's display. The Z is marginally faster than the Optimus G in the off-screen test, however the 720p display of the G allows it to be 27% faster onscreen in this synthetic benchmark. Aside from just CPU and GPU performance, I'm happy to also report strong mobile connections, pulling down 13 Mbps in the Melbourne CBD area on Optus HSPA+. 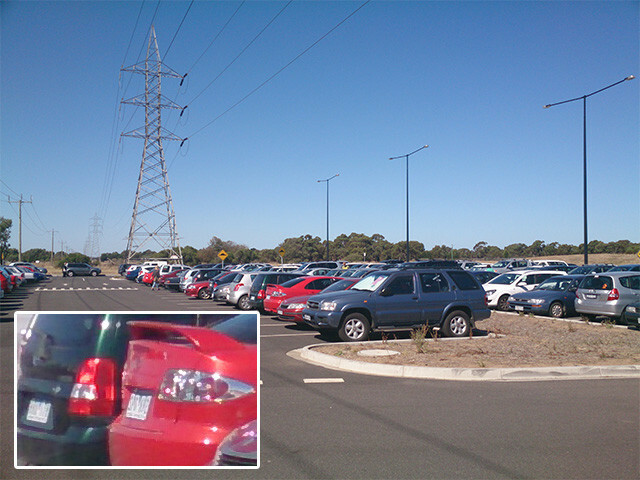 The Xperia Z was one of the few devices I've tested recently that forced a data connection at the troublesome North Melbourne train station, and generally speaking the signal strength I experienced was above average. All other connectivity channels - dual-band Wi-Fi, Bluetooth 4.0, GPS and NFC - also worked without fault. While overall the performance of the Xperia Z is very good, I still have my concerns over Sony's use of last-generation components in their headline smartphone for 2013. The Snapdragon S4 Pro sure is a fast and capable chipset, but it's left in the trail of newer devices such as the HTC One, Samsung Galaxy S4 and LG Optimus G Pro, which all make use of Qualcomm's newer chips. 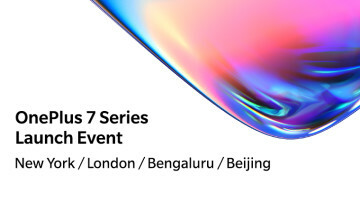 A speed advantage is not necessarily required with current flagships as most high-end devices are so incredibly smooth to use, but with phone contracts still hovering at the two-year mark, the aforementioned devices will surely have an advantage down the track. The very same thing happened with the Xperia S: it launched in early 2012 with an at-the-time perfectly acceptable Snapdragon S3 chipset, only to have it fall behind other devices released that year that packed Tegra 3s, Exynos 4 Quads and Snapdragon S4s. So while the Xperia Z's performance right now is wonderful and definitely keeping up with other top-of-the-range phones, be aware that two years from now those with a HTC One or Galaxy S4 may have a performance upper hand. I'm not saying it should be a huge deterrence from your purchase either, as the volatile state of chipset development makes relatively new devices outdated within months, but it's certainly a factor to think about. 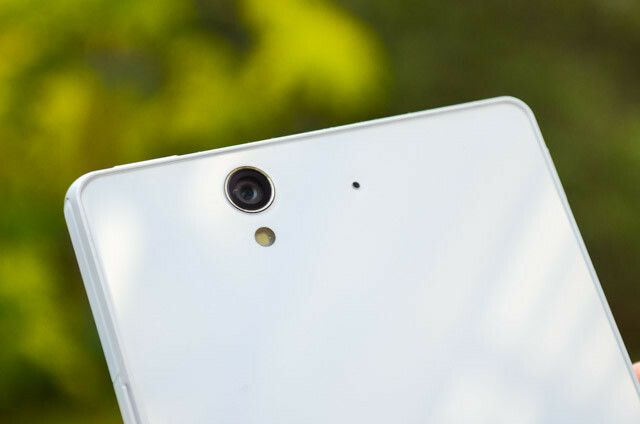 The Xperia Z is the first showing of Sony's new Exmor RS camera sensor, with Sony opting (quite sensibly) to use the highest-end sensor they've made in this phone: the 13.13-megapixel IMX135, which has been accompanied by the IU134F9-Z f/2.4 28mm effective lens module. Getting slightly more technical, the Exmor RS sensor packs 1.12 μm pixels (compared to 1.4 μm on the Lumia 920 and 2.0 μm on the HTC One), and also supports 1080p HDR video at 30 frames per second. The first thing you'll likely notice when firing up the camera for the first time is the incredibly smooth camera preview, which appears to be a fast 60 frames per second in all situations (including low-light). Moving the device around shows basically no lag between real life and the preview, making it quite an experience to frame your shots. There's also basically no shutter lag and the autofocus module is brutally quick; all great signs for the Xperia Z's camera. 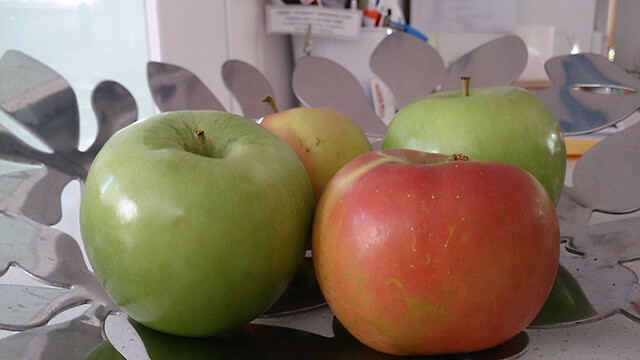 As far as the sensor goes for color reproduction, the Xperia Z performs very well in good lighting, accurately portraying scenes with an appropriate amount of saturation and contrast. Photos may not look as good on a computer as they do on the Bravia Engine-enhanced display, but generally the phone takes quite good shots, especially if you leave it in "Superior Auto" mode which appears to make the best automatic contrast, exposure and white balance decisions. In fact Superior Auto mode is so good at choosing which settings to use that it can often out-perform a manual HDR shot in terms of dynamic range, sometimes delivering a muted tone from the increased range. While there were occasions where Superior Auto made scenes look a little strange, it should be the first port of all for shooting with this camera, unless you want to do specific fine tuning using the plethora of manual features. 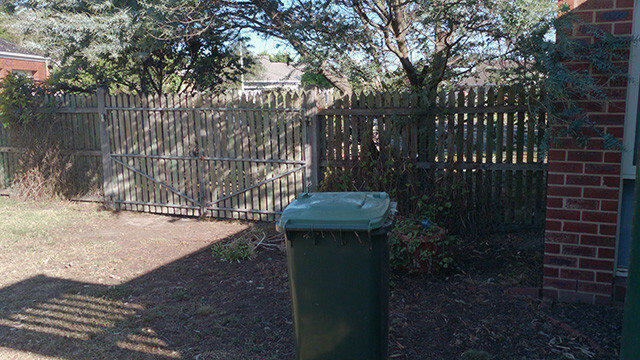 I did the majority of my photography on the Xperia Z in 9-megapixel 16:9 mode to make the best use of the 1080p display, however you can bump it up to a 4:3 13-megapixel shot if you desire. 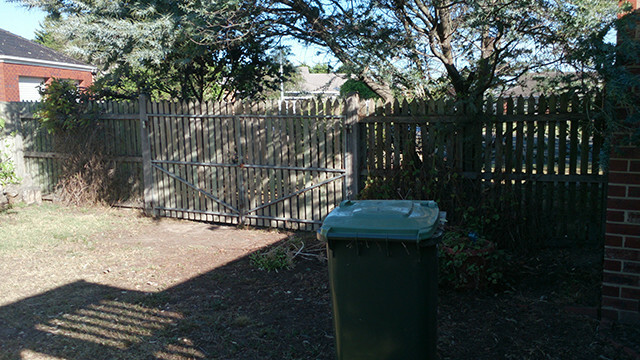 The 13 MP photos that come straight from the camera aren't the crispest going around (check the 100% crop in the bottom corner of the image below), but there is a lot of usable sizes to work with while downscaling - I found results to generally be excellent when taking the photos down to 1080p. In less-than-ideal shooting conditions, such as inside or on cloudy days, the weaknesses of the Exmor RS sensor begin to show. Color vibrance often drops off significantly when you might not expect it, although usually the photos still remain quite well lit without the use of a high ISO. I was perhaps hoping for a little better out of the Xperia Z in these conditions, but luckily we're still in the "decent" range as far as smartphone cameras go. 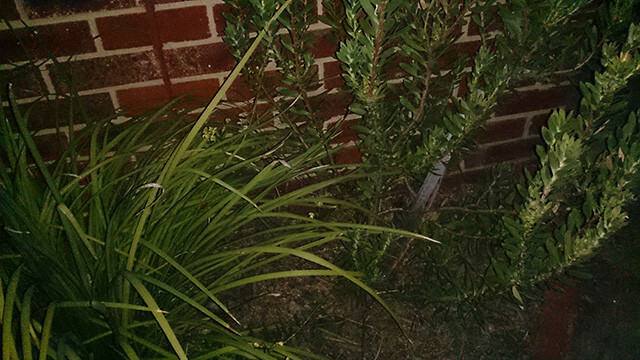 When you start going into the low-light realm, an area where the Lumia 920 and other optically-stabilized phones excel, the Exmor RS sensor performs surprisingly well, but not to the same level as phones that include OIS. 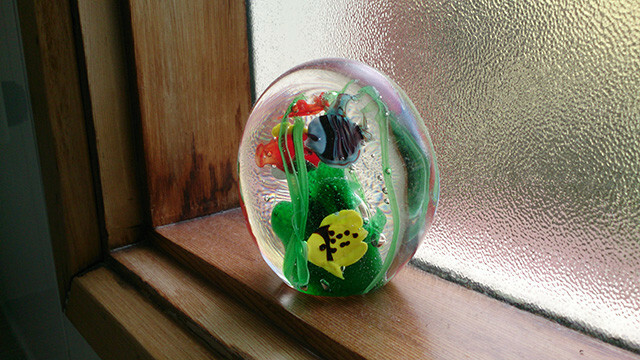 High-ISOs are often the first port of call for the Xperia Z, which can lead to considerable grain in photos, however generally the subject of the photos is visible even when background light is on the low side. 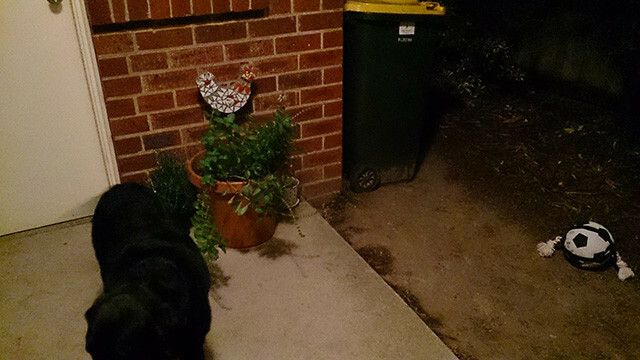 I also discovered that the LED flash on the back of the Xperia Z is not particularly powerful at all, often failing to illuminate items merely half a meter away. The front camera - a 2.2-megapixel Exmor R sensor with f/2.8 lens - produces some pretty decent shots in low-light thanks to the BSI capabilities of the sensor, but photos lack the clarity of the rear camera (as you would expect) and they're often quite grainy. 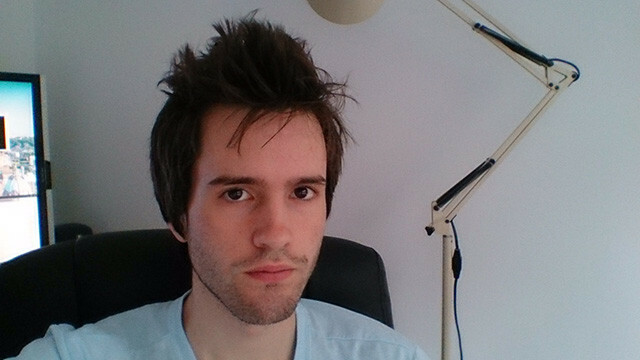 As usual, this camera should only be used for video chats and the like, rather than actual photography. 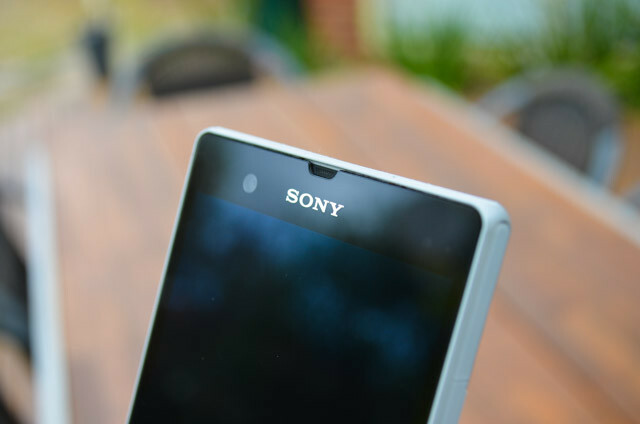 Aside from the settings I've already mentioned, such as the great Superior Auto mode, the Xperia Z packs a number of other great features that are worth a mention. There's a burst mode that can take 10 shots per second at 9-megapixels, which is pretty impressive, plus a sweep panorama mode, a quick button in normal shooting mode for video capture, and a button that allows images to be captured during video recording. 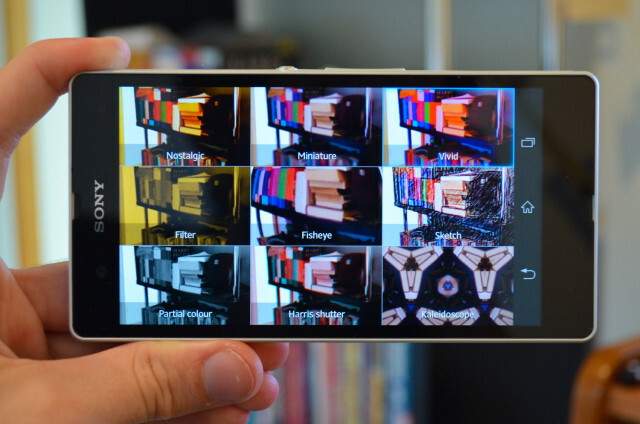 Perhaps one of the coolest camera features is the Pictures Effect mode, which initially shows all nine effects being live-processed side-by-side in a fantastic display of the power the Snapdragon S4 Pro delivers, although it's not perfectly smooth. Each of the effects is customizable and they can be useful for delivering something a little different from your stock-standard shot; I particularly liked playing around with the Harris Shutter. On to video recording, and the quality from the standard, non-HDR video is fairly acceptable, delivering decent 1080p footage with clear audio and responsive exposure correction. By default the camera uses object-tracking autofocus, which I found to be hit and miss, especially when you're recording a fast-moving object as the camera simply isn't quick enough to track it, however switching back to a standard single-focus works fine. HDR video recording wasn't nearly as impressive as I was expecting after hearing about the feature, with persistent issues negating any advantage of slightly higher dynamic range. When panning in the Xperia Z's HDR video there is an issue with strobing, and moving around seemed to always cause weird effects from the combination of two quickly-taken images - and when you factor in the negligible difference between the HDR and non-HDR video quality and clarity, it's a feature that's simply not worth using. 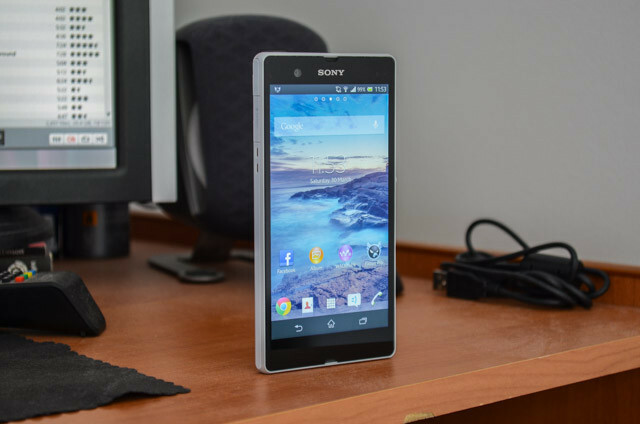 Sony has been traditionally strong when it comes to producing devices that excel in the media playback department, and the Xperia Z is really no exception to this. Not only do you get a spacious 5-inch display, which is perfect for the playback of videos, but there are also a number of great music-related features that audiophiles will be happy about. Before I get into what you can produce through the 3.5mm headphone jack, I'll briefly mention the external speaker on the Xperia Z, which is located on the bottom right-hand side of the device. When delivering notifications the speaker can go decently loud, enabling you to hear ringtones in loud environments, but it's neither the loudest phone speaker I've heard nor the best quality. As you might expect, you don't really want to be playing music through your phone's speaker. The results you can get through headphones and other external audio devices is much more impressive, thanks in part to a large range of audio settings present in the Walkman music player software. 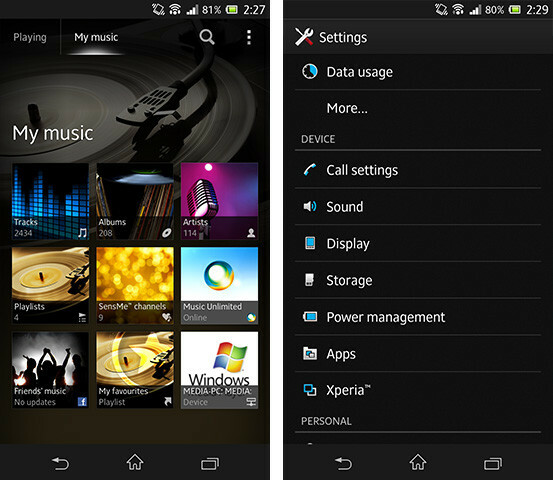 Without diving into any of options, so using a default set-up, the audio quality out of the Xperia Z is very good, delivering a solid balance of tones without overemphasizing the vocals range, which can be an issue on some devices. Diving into the settings and you'll find some decent areas for control, including a full graphic equalizer plus a number of presets. The most useful thing I found about this settings area was the dedicated bass volume slider called ClearBass, which you can use to boost bass levels ridiculously if you enjoy a bit more punch out of your headphones. I set the bass booster to around +3, but it goes up to +10 and down to -10 if you want more or less. Other decent settings include the option to volume normalize a your songs, meaning when you're listing to music you won't get drastic volume changes if your music is all different volumes, and an audio mode called ClearAudio+. I first had experience with ClearAudio+ on the Sony Vaio Tap 20, and while it works for external speakers, it's not so effective through headphones. 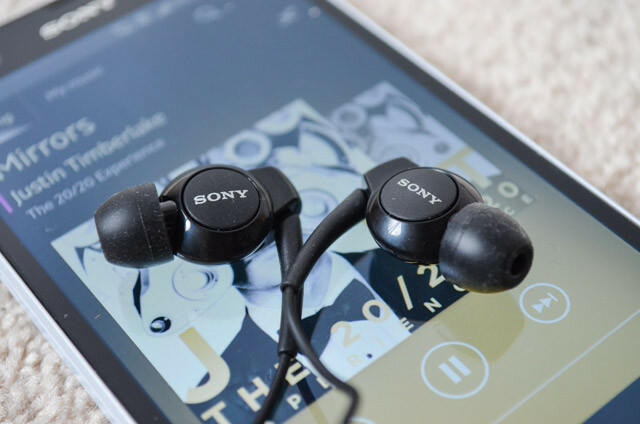 Sony made a small amount of fuss on their Xperia Z website about how they've bundled their MH-EX300AP ear buds with the phone, and although I was expecting a good experience I was a little let down. For me at least I simply didn't find the earphones particularly comfortable, and the sound quality was a little too focused on the upper spectrum for my liking. Maybe you'll have a better experience, but you'll likely either own or will be able to find a better set of headphones to use with the Z. 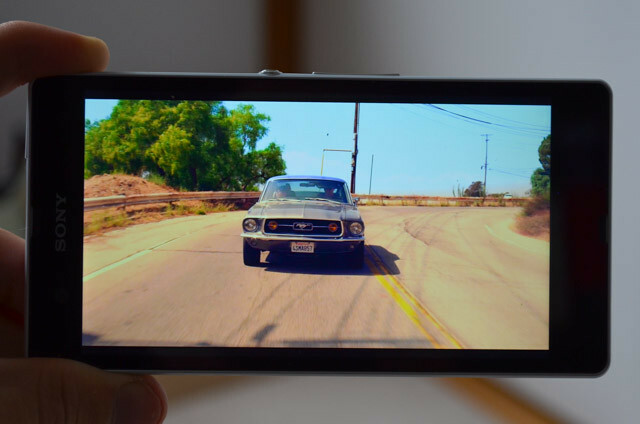 For video playback you'll obviously want the Xperia Z to be capable of 1080p playback, and naturally it delivers. The stock video playing app (Movies) is capable of smooth, stutter-free H.264 playback at 1080p, in both MP4 and MKV containers, as well as full 6-channel decoding so long as it's not DTS audio. 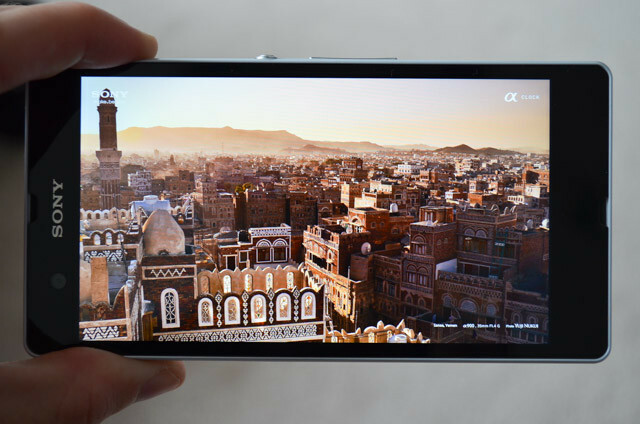 With the Mobile Bravia Engine 2 the Xperia Z is actually capable of enhanced videos outside the stock apps, so long as hardware decoding is occurring, however Sony's app is perfectly acceptable unless you require extra features. There were two formats in my collection that the Xperia Z didn't like too much, so I chucked them into MX Player - a freely available app on the Play Store - to see how capable the chipset is outside of hardware decoding. The first - a 1080p MT2S file with AAC audio - could be decoded using the hardware decoder (with Bravia Engine enhancements) but without audio, while switching to the H/W+ decoder brought back the audio at the expense of a few stutters. The software decoder also worked, but wasn't as smooth as the H/W+ option. The other format I wanted to try for the first time is a 4K video, which at 3840 × 2160 is a perfect (for scaling purposes) four times the size of 1080p, while still requiring a lot more resources to decode smoothly. The stock video player couldn't play the huge MP4 file, however MX Player gave it a go using the software decoder (H/W and H/W+ were unsupported). While the footage looked incredible on the display, it failed to play back without stuttering considerably, and the audio consistently cut out. Chances are you're not going to want to play back 4K content on your smartphone just yet, and that's a good thing as the Snapdragon S4 Pro is simply not capable. 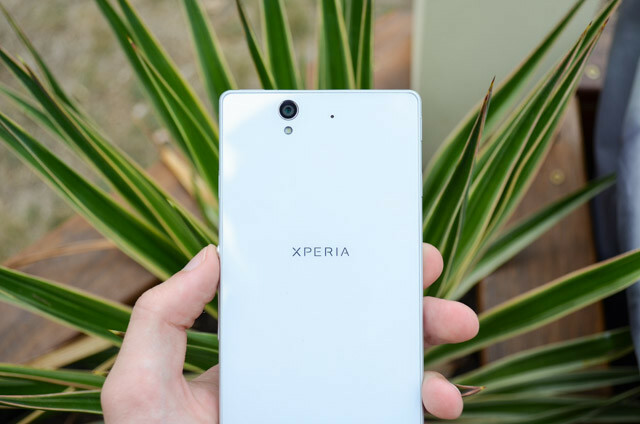 4K aside, the Xperia Z is a very good smartphone for enjoying videos, as the 5-inch display offers a lot of real-estate, 1080p videos are played back natively with ease, and the Mobile Bravia Engine 2 works in your favorite third-party applications. Like many flagship smartphones on the market at the moment, Sony has opted for slimness over battery life, including just a 2,330 mAh (8.85 Wh) battery to power the 5-inch display while keeping the device under 8mm thick. This is definitely no all-day battery, but Sony has included some software enhancements that try and eek out as much juice from the battery as possible. Without any battery saver mode enabled, on my first day of real use with the Xperia Z doing the usual daily tasks plus a bit of extra phone testing - a few messages here and there, a phone call, maybe an hour of web browsing, some Twitter, a few photos, etc. - I was left with around 15-20% of the battery when I arrived home. It was a pretty heavy day of usage for the Xperia Z, but at the end of it there was little room to move for using the phone more. The times when I've been testing out the performance capabilities of the Z, through gaming and other CPU/GPU heavy tasks, I found myself killing around 20% of the battery per hour. This equates to roughly five hours of super heavy usage, and likely this figure would be less were you to push the brightness up to the maximum for the entire period. 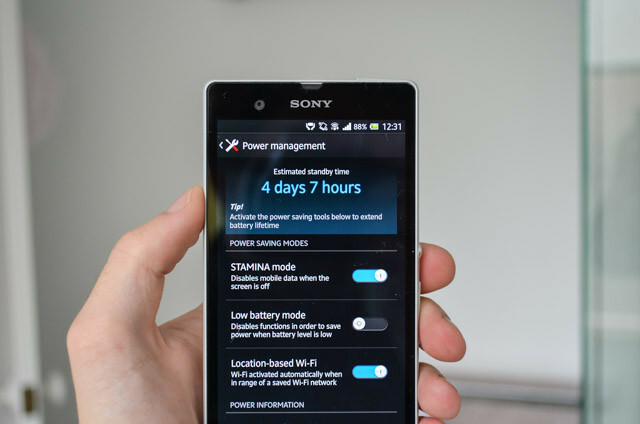 However I'm not going to go ahead and say the battery life of the Xperia Z is bad, because Sony have included fairly aggressive power management tools that work absolute wonders for increasing battery life. Just by enabling location-based Wi-Fi, so Wi-Fi would be disabled when I left my house, I ended the day with an extra 15% battery to spare (up to around 35%), however the real enhancements come while using "STAMINA mode". Sony has likely chucked all-caps into STAMINA mode to highlight just how much battery it can save, and the only thing it does is disable mobile data when the screen is turned off. While you do lose the ability to have things syncing constantly in the background, I managed to keep my overall battery usage under 50% for the day with the feature enabled, which needless to say was pretty impressive. However, if you do want background data, it may be a good idea to only enable STAMINA mode when you're battery drops below 40% or so (and an option to automatically do this would be nice). Just to compare the regular battery life of the Xperia Z to other devices I've tested before, check out the results of my battery life test. Here, I chuck a 720p video on repeat, at 75% brightness in airplane mode, until the battery gives way. 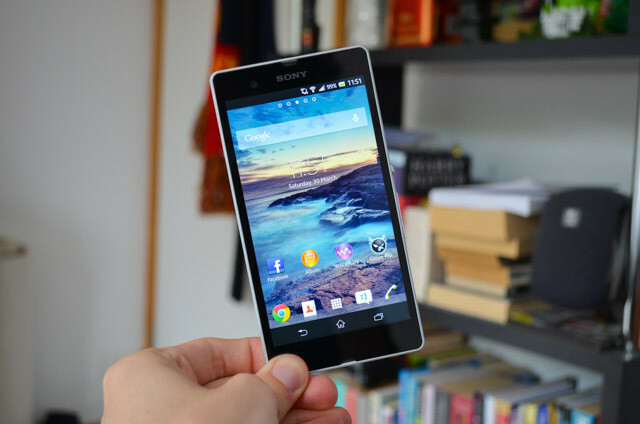 There's nothing wrong with the Sony Xperia Z per se, in fact in most respects it's quite good, delivering the most refined Sony smartphone design yet in a package with fast internals, a decent camera and a crisp display. The inclusion of a microSD card slot enables you to easily expand the storage capabilities, the battery saver mode works wonders to increase battery life, and there is a commendable range of media features. But at the end of the day I can't recommend the Xperia Z. Why? It's because being good just simply isn't enough anymore to make shelling out all this cash for a high-end phone worth it, especially if you're contracted in for two years. Competition is strong in the flagship Android space in 2013, and while the Xperia Z is on its own a great device that'll satisfy the needs of the majority of customers, there is no compelling reason to purchase it over, say, the HTC One, the Galaxy S4 or even the Nokia Lumia 920 or Nexus 4. Let's start with the 13-megapixel camera, which is pretty good in most circumstances and packs a lot of features, but there's no "Ultrapixel" design, there's no optical image stabilization, and the HDR video mode is nothing to scream home about. 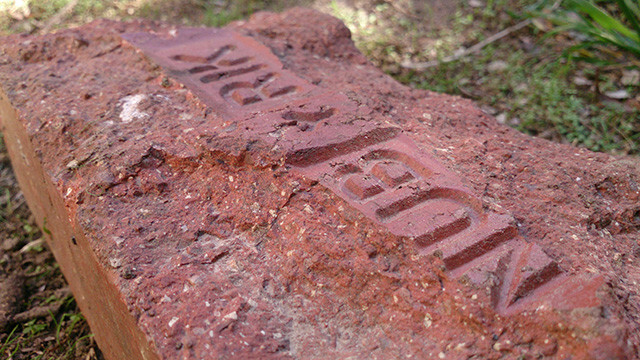 So if you're after a cameraphone, the Lumia 920 or HTC One will probably serve you better. The performance from the Snapdragon S4 Pro is definitely fantastic, but it's not the latest generation of chipsets, so you could save a decent amount of money opting for the similarly-spec'd Nexus 4, while also gaining the advantage of vanilla Android. Yes you would be downgrading the 1080p display to a mere 720p panel, but for all intents and purposes the sharpness trade-off is covered by the price differential, and you'll regain usable viewing angles as well. 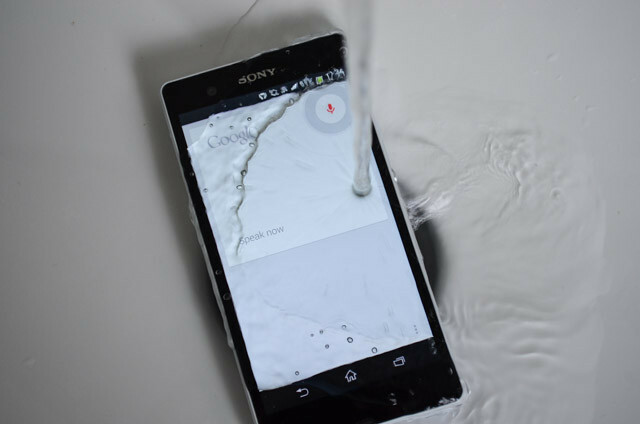 Yes, the Xperia Z does have a one-up on many of its competitors by having IP57 water resistance, but you can't use the touchscreen underwater, so it's not as useful as you might think. If you're a careful person you won't be going and accidentally spilling liquids on your phone or dropping it in water, so it's a feature that chances are you'll never make use of. Finally, there's just no software wow-factor that either introduces something cool to the table, or makes my life easier in some way. Interesting software features are absolutely critical in an age of smartphones where performance has far outstripped what's necessary, and although the Sony custom Android skin looks relatively okay as far as skins go, the Z doesn't have anything that brings the capabilities of Android to the next level. 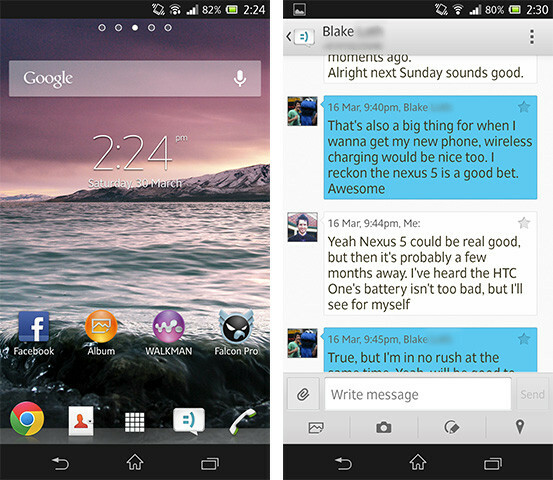 It's just Android 4.1 with a skin, nothing more. The Xperia Z just lacks that extra feature, that extra step of innovation that separates it from the jumbled pack of line-leading smartphones. Sony may have produced their best mobile device ever, but they haven't produced the best mobile device on the market - a simple, but unfortunate fact. → Buy the Xperia Z from Mobicity!